*Today was a pretty relaxing day. So relaxing, in fact, that I spent the better part of it in my pajamas. *I streamed the Kellogg Wildcats vs. Gooding Senators football game and cast it onto our television, and it was such a great game. Even though the team lost 21-20, they played their heart out, and I am so very proud of these boys. *I had a couple of plants that needed planted outside in the ground, so Paul and I headed outside later in the afternoon. It wasn’t snowing too bad, so we planted some lavender in the backyard and a hydrangea bush in the front yard. *I was determined to have food on the table before we left for the theater tonight. And I succeeded. In the morning I went down to the freezer to see what I could find. There was a gallon bag of frozen tomatoes in there, and a small frozen bag of hamburger meat. So I thought to myself....taco soup in the crock pot!! I had never made taco soup in the crockpot, but I thought I would try. 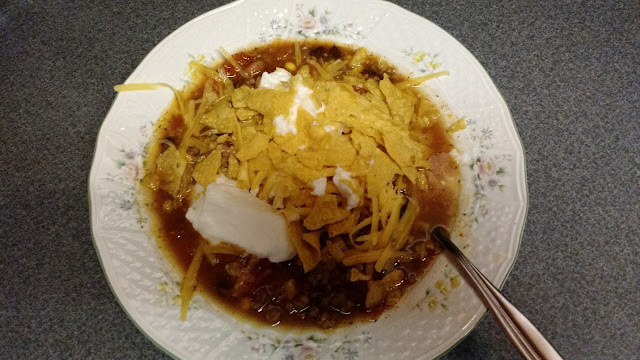 I looked on Pinterest for taco soup crock pot recipes, modified it a bit with the ingredients I had, and by 5 p.m. we were enjoying delicious bowls of taco soup, topped with plain Greek yogurt, cheddar cheese and tortilla chips. *Another enjoyable night at the theater. Wallace had quite a bit more snow than Kellogg. There was probably about three inches by the time we left the theater last night, and Kellogg maybe got an inch.